Description: Baba Yaga, that fascinating and frequently malicious grand dame of Russian fairytale, flies through the air on her enchanted mortar and pestle. Her silhouette, all crooked elbows and iron teeth, is emblazoned on the front of a 100% organic cotton crew neck t-shirt. The fabric is thin, ultra-soft, and an elegant cream. The shirt is unisex in size, roomy for the ladies and more fitted for the gents. A very small story about Baba Yaga and the time she lost her house is printed on the inside back. Each of these items is hand screened (by us! ), so every one is unique, slightly different, not uniform, but hopefully just right in every way that matters to you, O Best Beloved. Pictures by Shannon. Story by Megan. 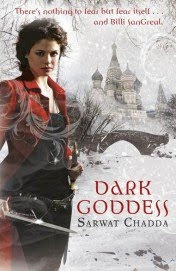 Our Etsy giveaway today is inspired by the book Dark Goddess by Sarwat Chadda. Billi SanGreal is in for the fight of her life against Mother Russia, Baba Yaga…her special oil was donated by the shop owner at Rita’s Spiritual Goods. 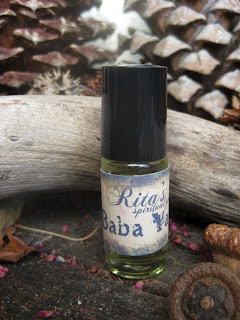 “Rita’s Spiritual Goods is your place for good juju, tools created and inspired by the energy and spirit of real life, what you need when you need it. I channel the magic of the energy in each moment of real life, whether it is happy, sad, frustration, confusion, quiet, meditation, bliss, love, pain, family, friends, foes etc., and let those moments inspire me into creation. Each recipe is unique to its own and each magical working full of love and energy and always made when the moon is right. I have had many magical things happen in my life and experienced many unexplained events. I believe whole heartedly in the spirit that embodies everything around us and within us. I believe in earth angels, guardian angels and ghosts. I believe in fairies. I believe in signs. I believe in soul mates and kindred spirits. I believe in rituals and praying. I believe in positive energy. Most of all I believe in magic. 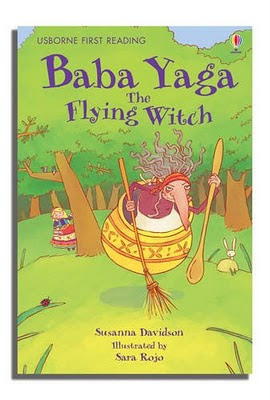 Description: Baba Yaga is the old woman of autumn, the archetype of the fearsome witch. Her roots lie in the ancient Slavic goddess of death and birth, whose wheat sheaves in the autumn fields hold the promise of winter survival and spring’s growth. Baba Yaga flies through the air in a mortar, rowing with a pestle, or in a cauldron, sweeping the traces of her path with a broom. Her realm is the birch forests, birch being the tree of beginnings and endings. Baba Yaga represents the power of old age, the power of the archetype of witch, and most of all, the power of the cycles of life, death and rebirth. Although she is mostly portrayed as a terrifying old crone, Baba Yaga can also play the role of a helper and wise woman. The Earth Mother, like all forces of nature, though often wild and untamed, can also be kind. In her guise as wise hag, she sometimes gives advice and magical gifts to heroes and the pure of heart. The hero or heroine of the story often enters the crone’s domain searching for wisdom, knowledge and truth. She is all-knowing, all seeing and all-revealing to those who would dare to ask. She is said to be a guardian spirit of the fountain of the Waters of Life and of Death. Baba Yaga is the Arch-Crone, the Goddess of Wisdom and Death, the Bone Mother. Wild and untamable, she is a nature spirit bringing wisdom and death of ego, and through death, rebirth. To Enter to win a bottle of Baba Yaga oil simply comment below. Contest ends April 8, 2011 and is open internationally. Our second ETSY giveaway for the book Haunted by Joy Preble was graciously donated by shop owner StudioMME… “I’m a girl from the frigid land of North Dakota who just moved to sunny San Jose. I play with pens and lots of ink. I like ice cream, chocolate, and just about every type of cereal. The Grimms and Edward Gorey were my bedtime stories when I was a kid and it’s safe to say that they influenced me quite a bit. My quirky little shop contains prints of my original illustrations, canvas bookmarks, note cards, and a few notebooks. 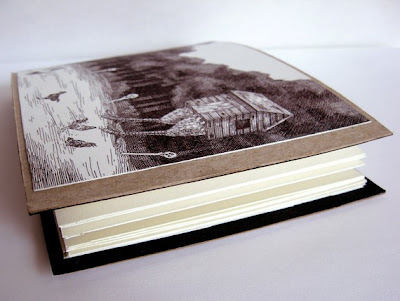 Description: This little ‘redo’ notebooks features my illustration, “Baba Yaga“. All of us wish life were full of redos, and that’s exactly what I’ve given these prints. Occasionally my printer decides to spit out a stray drop of ink, making a print unacceptable for a buyer to purchase. Over time these ‘marred’ prints began to build up until one day I had the idea to give them a redo. Now these prints are back and better than ever as mini notebooks. Made with lightweight cardboard and lined with black pastel paper, these little notebooks feature 20 pages of Strathmore 400 drawing paper. Excellent for note-taking or small sketches. The notebook measures roughly 4.5″ x 6″. THE DARK GODDESS will take Billi to Russia to rescue Vasilisa, a young girl Billi’s promised to protect. To save her, Billi must defeat the werewolves that serve the witch Baba Yaga – and the Dark Goddess herself. Betrayed and alone, Billi faces a final mighty battle in the abandoned ruins of Chernobyl. Out in 2010.